Quality vs Cost for your Kitchen? My initial thought was to go for a gloss white kitchen as I liked the sleek and contemporary feel of it but I was concerned about keeping the white doors clean and wondered if it would date too quickly. I then quickly set my mind on a shaker kitchen and proceeded to get some quotes from some well known companies and got as far as almost putting a deposit down had it not been for my work colleagues. They convinced me I was paying far too much and should look around. Frankly, I was fed up of getting quotes etc… as it was quite time consuming (especially as my husband had left it all to me and said he would be happy with whichever company I chose to go with!). So I started my search again and a friend recommended Allesley Kitchens in Coventry. I visited the showroom and was very impressed with the displays (note – I had come back to a gloss white kitchen by this time). They supply German Kitchens of a very high quality and by the end of the demonstration I knew this was the company I had to go with. Even though their quote was much higher than the other companies and more than I had expected my mind was made up – I had to have this kitchen! To cut a long story short, going for the cheaper option is not always the best choice – yes the kitchen was expensive but I have never regretted it. The whole project was managed by the owner from start to finish – this was a godsend as he dealt with any issues that came up and I really did not have to get involved. He designed the kitchen and his two installers worked endlessly to make sure everything was perfect and if it wasn’t quite right they worked on it until it was. Happily the end result is that we now have a fantastic kitchen which is perfect in every sense. I am so glad I decided on gloss white as this is definitely the right choice for us. The white doors are easy to keep clean as there are no grooves for dust to get trapped. 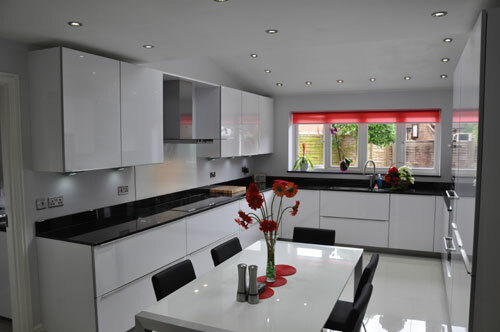 The spotlights in the kitchen reflect in the doors and on the polished floor so the overall look is very modern. I would recommend looking at the range of different options for a kitchen and believe that finding the right company, as I did, is more important than saving on costs. For those who don’t mind paying a bit more, there is also the reassurance of a company where the people are passionate about what they do and the quality of the service they provide. Previous Post How safe is your fire door? Read about industry opinion, companies and products including some anecdotes about building projects and renovations. Are you an industry expert with an opinion or story – we’d love to hear from you! Your Business Premises and Metal Theft: Have You Got What It Takes?